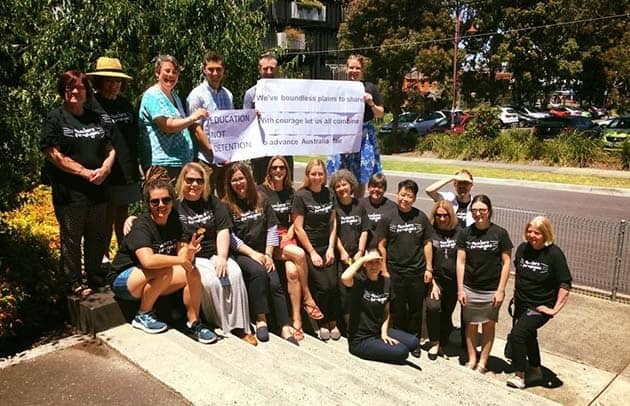 Hundreds of teachers across NSW and Victoria wore t-shirts carrying the slogans “Teachers for Refugees; Close the Camps, Bring them Here” during Human Rights week in December. Despite threats from federal and state governments, we wore them to class, at lunch time, or before school, and found ways to make sure the school community could see our message. Thanks to the extreme response from the Turnbull government, and the calls to sack participants, staffrooms were filled with discussion and debate about teachers’ right and responsibility to protest the offshore camps all week. The debates cut to the core of what education is about. Turnbull was obviously terrified that a well trusted group of workers like teachers were opposing government refugee policy. They wanted us to stick to the pursuit of NAPLAN test scores and delivery of “the 3 Rs”. One Melbourne primary school teacher was told (as many of us were) that she could not wear the t-shirt as it would break the code of conduct that requires public sector employees not to comment on government policy. She wore it in the next day and explained to her principal that teachers at their school had a tradition of modelling compassion and refugee advocacy. The principal not only accepted her decision, she bought a t-shirt off her! Other teachers weren’t able to get their principal’s support, but defied directives not to wear the t-shirt anyway. Dance teacher Daniella Olea wrote a reply-all response to an intimidating principal email: “I’ll be neutral about refugees when the government treats refugees neutrally”. Sixteen teachers from her school joined her in disobeying the principal’s directive. Across NSW and Victoria teachers were discussing the contradiction of being legally required to report suspicion of abuse of children in our schools, but being threatened with our jobs for speaking about the abuse of children kept in detention camps by the government. Our t-shirts sparked conversations with students. A group of Year 8 and 9 students watched 30 teachers at our school walk out of the staffroom together, all wearing our t-shirts. “Why are you protesting?” one asked us—and another student jumped in; “for the refugees, didn’t you see!” Shouts of “great t-shirt miss!” followed through the corridor throughout the day. We were proud to set an example to our students of how to stand up for refugee rights. Lilly, a primary school teacher at a school with many refugee families said she had sensitive and honest conversations with students about the rights refugees deserve. Parents picking up students gave her and the t-shirt clad teachers “big smiles” of encouragement. Thach Ly, a physics teacher who had come as a refugee in the 1970s spoke at the Melbourne Teachers for Refugees vigil of how refugee policies and rhetoric had made him feel ashamed of his refugee heritage. But this week, he said, he felt proud to be a refugee and a teacher. While we were setting a standard of anti-racism and solidarity in our schools, the Prime Minister, the Immigration Minister and the Education Minister were having conniptions about losing their grip on the refugee debate, and teachers in general. They could not counter our arguments that the camps are inhumane and illegal, so they tried bullying and intimidation. While state education ministers caved in their pressure to direct teachers not to participate in the t-shirt action, this only meant more teachers decided it was time to take a stand. Each news report of “crack downs” on our action provoked a new wave of messages and phone calls from teachers wanting to get their hands on t-shirts. Many organisations declared their wholehearted support for our action, including the Victorian Trades Hall Council, the Australian Education Union and the National Tertiary Education Union, GetUp, the Refugee Council of Australia and the Asylum Seeker Resource Centre. This makes it unlikely that any teacher will be formally reprimanded for their involvement. We need to build on the momentum. Already, the Queensland Teachers Union have flagged they will be supporting a similar t-shirt action. Equivalent actions by nurses, social workers, construction workers, librarians and other groups could follow. Teachers for Refugees can encourage speakers and share teaching resources, defend students from deportations, and ensure refugees are not excluded from education because of their visas. And we will be looking for the next opportunity to put our collective pressure on the Turnbull government to close the camps.